The bike ride goes around the whole of Pineview Reservoir. With the leaves changing and the blue of the lake, this is one of the more beautiful races in state. The distance is a great way to challenge yourself beyond the sprint. It’s not a very crowded race but it is competitive. You going to see some elite athletes out there. The run goes through the brush and dirt along the lake making the distance feel less than 4 miles. If you can’t find parking on the street, you’ll have to park in a field loaded with little stickers. I counted thirteen flat tires on the bike race. Definitely carry your bike in, do not roll it. This isn’t the best race for a first timer. Give a sprint distance a whirl first. 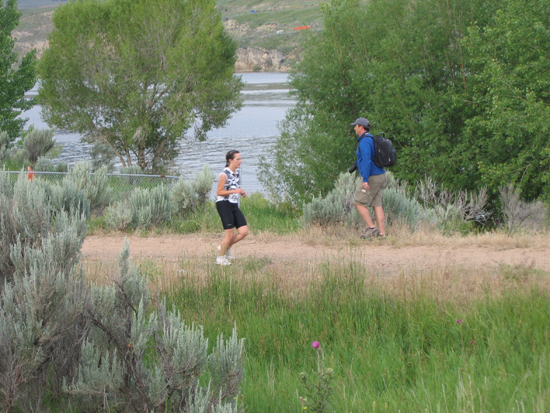 This race attracts some serious competition, which meant I didn’t even get a photo taken by the race photographer. He must’ve stayed with the main group.